Fantastic family-friendly gallery opened here in 2011. 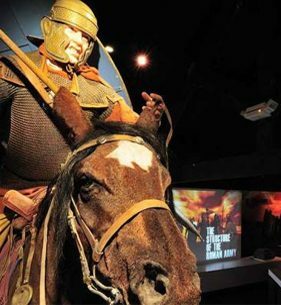 Set in magnificent countryside next to a sweeping section of Hadrian’s Wall, the Roman Army Museum is an authentic and dramatic tribute to Rome’s extraordinary military legacy. Step into the life of a Roman soldier and experience life on the front line of Emperor Hadrian’s formidable British frontier. Explored through reconstructions, objects excavated along Hadrian’s Wall and the Vindolanda Trust’s inspiring interpretations of army life including the exclusive 3D Edge of Empire film, the museum pays unforgettable homage to Rome’s military accomplishments in Britain. The displays bring to life the organisation and discipline of the Roman Army, the many different roles and duties of the soldiers, their equipment and training and daily life. The role of the army in building Hadrian’s Wall is explored in a dramatic new display inspired by the sculpted reliefs on Trajan’s column in Rome. The Edge of Empire film presents the story of the building of Hadrian’s Wall and links the Roman Army Museum and Vindolanda. The nearby fort of Carvoran (not accessible) was occupied by a regiment of Syrian archers. The Roman Army Museum is managed by the Vindolanda Trust. Coffee shop and bookshop.